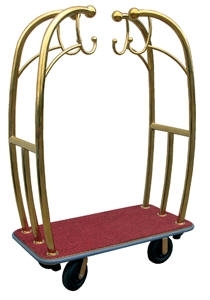 This luggage cart features a one of a kind look, sure to impress any hotel guest. A great way to make a great first impression. Great for hotels, stores, and other commercial applications. Carpeted platform to prevent scratching of delicate items. Model No. Platform Size Handle Height Capacity (lbs) Caster Type Net Wt. (lbs) Price Ea.